Nearly 60 percent of Iowa farmland is owned by someone other than the family farmers who operate it. This means that a majority of Iowa farm land-use decisions are made by the owners, while daily conservation management decisions are made by the operators. The way this happens is as unique as farmland in Iowa. It varies. Even so, farmers, landowners and experts in conservation are finding ways to make it work. We share three perspectives in this story. Roger Winterhof grew up on a farm in northern Iowa but pursued a career in agricultural lending. Today he’s a landowner living in a Des Moines suburb. He wants to improve the value of his property as well as meet the needs of “other stakeholders in the community,” he says. Last year, Winterhof partnered with a tenant, Perry, Iowa farmer Tom Vincent, to install one of Iowa’s largest saturated buffers next to a turn-of-the 20th century drainage ditch. On a frosty morning in February, the two men climbed into Vincent’s pickup to show a visitor seven shiny new metal boxes along the ditch that are called control structures. Plastic boards inside them can be raised or lowered to control water from existing drainage tiles so that the outflow can be diverted into buried tile running under an existing grass buffer along the ditch. As the truck bounces over the buffer, Vincent explains that when the tile water seeps under the plants in the buffer, at least half of the nitrate is removed before it reaches the ditch. Four of the control boxes are on the north side of the ditch, below a field Winterhof rents to Vincent. The other three are on Vincent’s land on the south side. The saturated buffers treat water coming from about 80 acres to the north and another 40 acres on the south side. “If we can help treat some of the groundwater that goes through natural processes, why not do that and be part of the solution?” Winterhof asks. Winterhof is more involved in the farm than some landlords. He rents it out for a share of the crop and he shares input costs. He even helps with spring field work and running a grain cart at harvest. 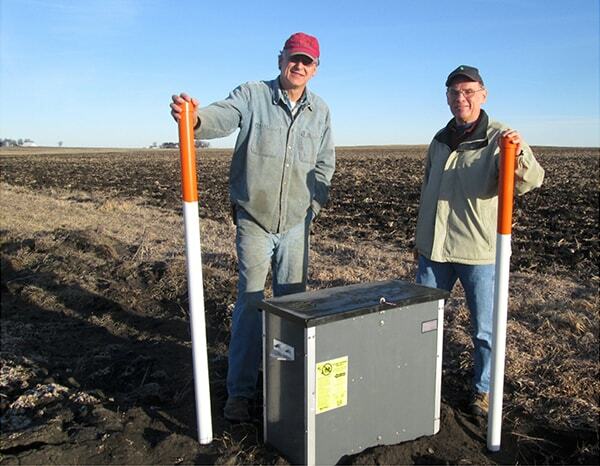 At one time both men thought that sampling soil nutrients on a grid and using test results for variable-rate fertilizer application would control nitrate runoff. They still do that, but they’ve learned that even with sound management, significant amounts of nitrate come from soil organic matter, can move below the root zone and enter tile lines. Cover crops can also take up soil nutrients and Winterhof is working with another tenant in northern Iowa to experiment with that approach. But at his Perry farm, he likes the flexibility of the saturated buffer. It will remove nitrate every year, perhaps as long as a century or the life of the tiles. The up-front cost of about $20,000 seems high, but the annual cost per pound of nitrate removed turns out to be one of the least expensive approaches for managing nitrate. Like farmers, Winterhof also worries that producers face the risk of regulations if they can’t make improvements in water quality. He agrees with Vincent that Iowa’s current voluntary approach gives farmers a menu of options for managing nutrients. “If you have a regulatory approach, you wouldn’t have a menu,” Winterhof says. That mixture of altruism and a desire to avoid government regulations is just part of what drives landowners to participate in practices that improve water quality and help them better manage nutrients. As watershed coordinator for the headwaters of the North Raccoon Water Quality Initiative, Lee Gravel has worked with both farmers and landowners on about 50 water quality projects in the past year. He started out in Cherokee County and now works in the Buena Vista and Pocahontas County Soil and Water Conservation District offices. Just under half of the projects involved landowners, he says. Producers reduced tillage or started sowing cover crops. “Most of the people I work with, their landlords are all on board with it,” Gravel says. In a few cases, changes in farming practices were driven by landlords. When asked if he finds any obstacles to convincing landlords to invest in nutrient management, Gravel says, the thought process varies. Some hesitate to make investments due to uncertain future decisions. Some are unaware of the complexity of the challenge and the solutions. Some don’t know that Iowa’s voluntary Nutrient Reduction Strategy is part of an effort in the entire Mississippi River basin to reduce nutrients flowing into the Gulf of Mexico. For the most part, though, Gravel finds enthusiastic interest in conservation and water quality. Ultimately, altruism alone won’t be enough to meet the goals of Iowa’s Nutrient Reduction Strategy, Steve Bruere believes. Bruere is a landowner who also manages land for other owners through his farm real estate brokerage firm, Peoples Company in Clive, Iowa. Bruere sees in-field practices such as cover crops as something that benefits the landowner financially. With cover crops, “you’re increasing the yield potential and it capitalizes into the value of the land, long term,” he says. In fact, Bruere believes landowners should pay the costs for cover crops. He compares that to the maintenance costs paid by owners of commercial real estate. The estimated $4.8 billion needed to improve Iowa’s water quality is a lot for farmers, but only a small percentage of the estimated $220 billion value of Iowa’s 30 million acres of cropland, Bruere says. Bruere practices what he preaches on the small farm he owns in Warren County, Iowa. He leases it to his father and brother. Bruere pays for cereal rye seed and the cost of flying it onto the field. They pay the termination cost in the spring. Because edge-of-field practices like saturated buffers and bioreactors don’t improve productivity and sometimes take land out of production, Bruere thinks Iowa needs to find creative ways to make them attractive to landowners. Farmer Tom Vincent and landowner Roger Winterhof have worked together to address water quality. They installed saturated buffers, an Iowa innovation.